Until 2015, Northern Ireland didn't really have any motorway services. However, for years there was a petrol station signposted from the M1 which is often overlooked. 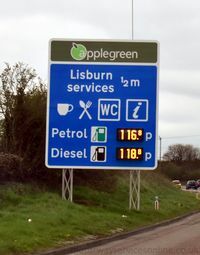 This section lists all the signposted service stations on motorways in Northern Ireland. There is a whole minisite for services south of the border. Pages in category "Northern Ireland's motorway services"